The Sterling Royale Euphonium is the culmination of many years of development with some of the world’s finest euphonium players. The Sterling Royale Euphonium is a compensating model, perfect for High School and Intermediate players looking for the lowest price possible. 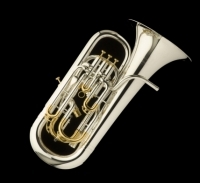 The Sterling Royale Euphonium comes with a Standard Yellow Brass Bell. For more details on this exciting offer, please contact our Specialists Jeff or Neal!!! The Sterling Virtuoso Euphonium is the culmination of many years of development with some of the world’s finest euphonium players. For more details on this exciting offer, please contact our Specialists, Jeff or Neal!! !